How happy am I that fall seems to have finally arrived, and with it weather conducive to all the soups and stews I love to make? After the weekend’s excesses (can we say Halloween candy, roasted marshmallows, and more hot dogs than I care to admit that I ate? ), I was in the mood for something healthy with loads of flavor. So of course I hit the freezer and immediately thought of some kind of crock pot soup, which of course I must pass on to Souper Sundays at Kahakai Kitchen. I had 3 New York strips in the freezer, so I decided to turn them into a soup. Adding a jar of this and a handful of just about every other vegetable in my freezer, and I came up with this tasty and flavorful dish that goes great with a grilled cheese. Mmmm. This makes 4-5 servings in a 4 quart crock pot. Spray a skillet with cooking spray and saute your steak until you get a nice caramelization. Add the salsa, vegetables, and beef broth, topping off the liquid with water (or more beef broth if you happen to have it). Cook on low for 8-10 hours or high for 4-5. Throw the macaroni in at the tail end and cook until soft (about 15-20 minutes depending). Serve with your favorite grilled cheese. 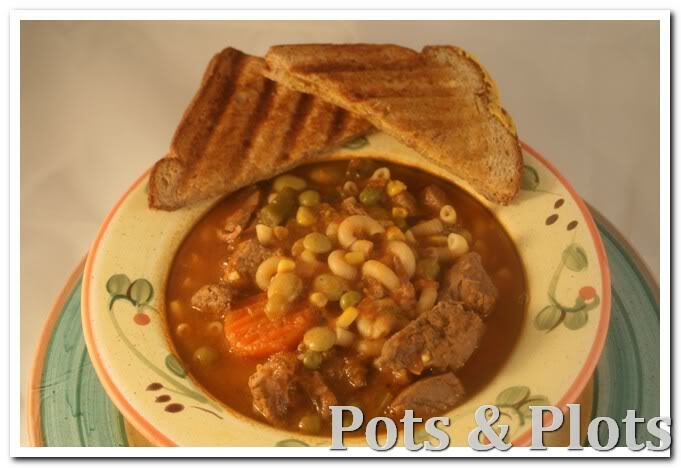 A fun soup–love how easy it is in the crock pot and all the veggies. Thanks for bringing it to Souper Sundays. Your new blog design is awesome too–so fun!